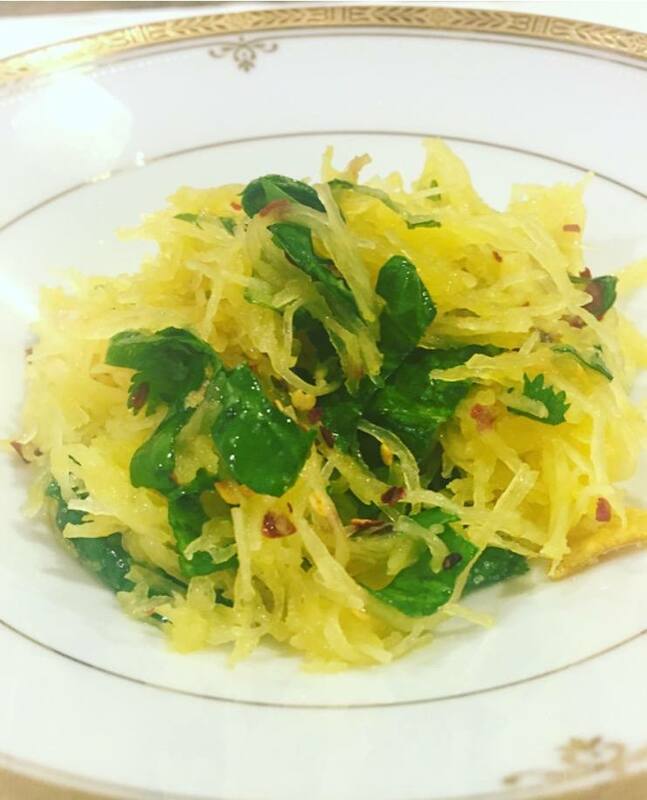 Spaghetti squash is so easy to make, even if you are not a natural in the kitchen you will still be able to make this. When you are picking out a spaghetti squash in the market you will want to make sure there are no soft spots on it. Also, find one that feels heavy, if it is light then it will probably be dry on the inside. Spaghetti squash has high water content so it will help if you are one of those people who don’t drink enough water in the day. It also is a good source of fiber which will help you feel fuller faster. Spaghetti squash is high in beta-carotene. Beta-carotene promotes healthy skin and eyes, also it helps you maintain a strong immune system. It is also high in vitamin A and potassium. Spaghetti squash also has a similar texture to pasta, so you don’t have to prepare it like my recipe. You can bake it, scrape the flesh out with a fork and toss it with your favorite pasta sauce. It’s much lower in calories than pasta so it’s great if you are trying to watch your weight or if you are on a diet. Drizzle the 2 tablespoons of olive oil on the squash and season with salt and pepper. Place cut side down on a parchment-lined baking sheet if you don’t have parchment paper you can over the squash with aluminum foil and place on a baking sheet. Cook the squash until it is tender, you can check on it by poking it gentle with a fork or with a knife,. It should take about one hour. Once it is roasted, take it out of the oven and let it sit for a few mins so you can handle it. Once it is slightly cooler gently scrape squash with a fork to remove flesh in long strands and transfer to a medium bowl. Toss with remaining 1 tablespoon oil, lemon juice, and parsley. Season with salt and red-pepper flakes and serve sprinkled with cheese. OMG i’m making this recipe this week! I love all your recipes! I have been looking for an easy spaghetti squash recipe. I am estactic to try this one.